Do you have a little one at home that loves camping & the outdoors? 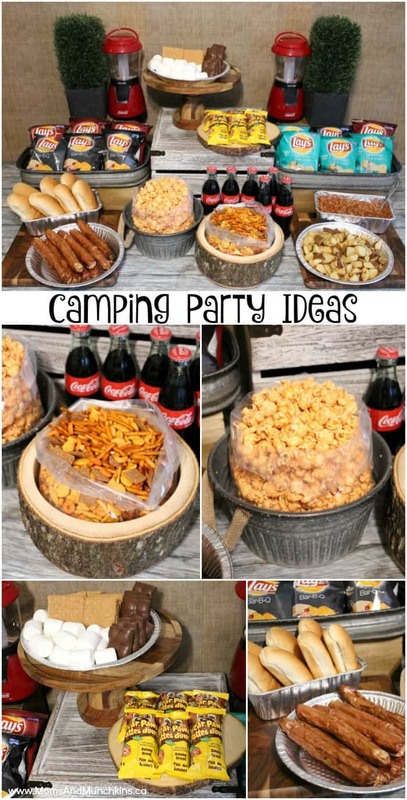 If so, then this post of camping party ideas is for you! Here you’ll find fun ideas for invitations, decorations, activities, food and treat bags. These ideas can be customized for either an indoor or an outdoor camping party. What do you picture of when you think of camping? Tents, roasting marshmallows by the fire, fishing, lanterns? You can work many camping items into your theme both for an indoor and outdoor camping party. Here is a fun post with ideas for camping indoors (glow in the dark stars, gummy fish cookout, using your imagination to make boats for fishing, etc.). Your party area could include small tents, lanterns, firewood, sticks for roasting hot dogs, fishing rods, fishing nets, signs like “Do Not Feed The Bears”, folding tables with checkered picnic cloths, etc. You’ll find plenty of ideas when visiting the camping section of your local department store. There are so many fun activity ideas for a camping party! How to Tie a Knot: A great wilderness guy (or gal) needs to know how to tie a great knot. 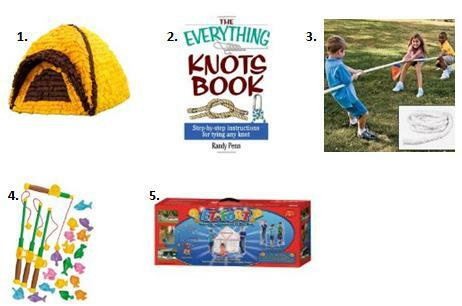 An instruction book on how to tie knots could be turned into a fun competition. Perhaps the person to tie a proper knot the fastest wins or maybe the little guests can track down the wild bear (stuffed bear or a husband who is good sport) and tie him up. Tug of War: This is a fun game to test the strength & teamwork of your little campers. Fishing: An easy way to plan a fun fishing game is to use a kids pool with a magnetic fishing rod and fish. Building a Tent: With some spare poles (you’ll find something that will work at your local hardware store) or a fort building kit for kids and old sheets, you can give the guests the challenge of creating their own tent. If you’re planning a sleepover party, they can use this tent to sleep in or read campfire stories in. Sleeping Bag Races: If you are planning a slumber party, sleeping bags can be used for sleeping bag races. Simply get in the sleeping bag and try to be the first person to hop across the finish line. 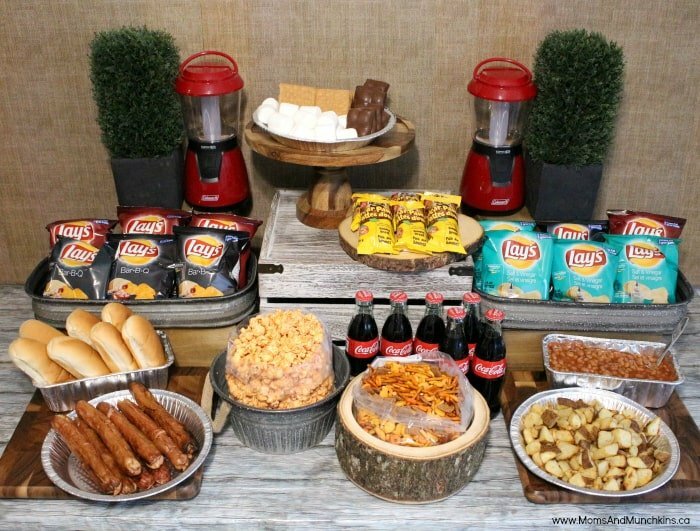 Your camp party food could include camp favorites like roasted hot dogs, veggies steamed in aluminum foil packets, juice served in canteens and picnic salads. Coolers could be used to store drinks and cold food items for the guests. Folding tables could be covered with checkered tablecloths and food could be served on wooden serving trays. For a camping birthday party, you could skip the traditional cake and go with something camp-inspired like roasted marshmallows or s’mores. Who needs a candle on a cake when you can blow out the flame on a roasted marshmallow, right?! Okay, an open flame around kids may not be the best idea. Some other fun ideas for your dessert table include gummy fish labeled as the “catch of the day” and marshmallows on sticks, dipped in chocolate and topped with red sprinkles to make them look roasted (see the photo at the top of this post). Creating camping-themed treat bags is a lot of fun! You can make little s’mores kits (graham crackers, chocolate and marshmallows) or pack some items perfect for the outdoors like mini compasses, mini lanterns, gummy bugs, toy binoculars and more! 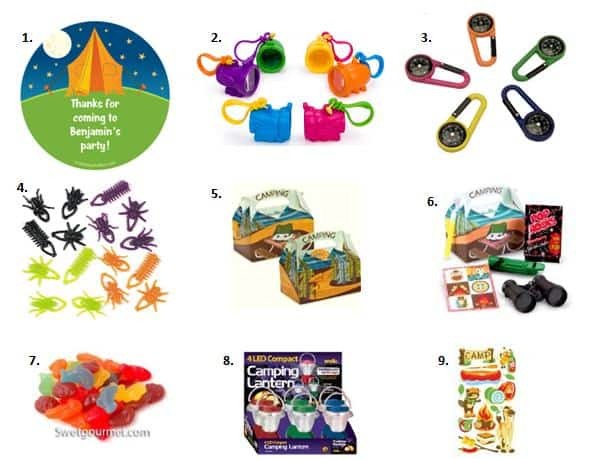 For more camping party ideas, check out this post all about a Backyard Birthday Campout! We love a good party and that’s why we’re always sharing new party ideas with you. Never miss an update by following along on Facebook, Twitter, Pinterest and sneak peeks on Instagram! *Disclosure: I am part of the Tiny Prints, Inc., Birthday in a Box and Amazon affiliate program. All opinions expressed here are 100% my own. This is an awesome post! Very cool ideas! We almost had a camp out party for my little boy’s birthday!! But it is too cold to do so…! Your ideas are great, as always!! We go camping every year. As the kids get older, we’ll have to try out some of these ideas. How fun! We go camping every year. As the kids get older, we’ll need to try some of these.